Fairways Scotland provide bespoke luxury golf tour packages to Scotland around some of the finest golf courses in Scotland. From those on every golfer’s bucket list such as Kingsbarns, Royal Dornoch, Carnoustie and The Old Course, St Andrews to lesser known golf courses in Scotland including the likes of Scotscraig, Montrose & Golspie Golf Club. We love working together with our clients to ensure every golf trip is a unique and unforgettable experience personal to them! Check out some of our sample golf tour packages below to see what we can do for you. Furthermore to help you build your dream golf vacation to Scotland & discover Scotland’s fantastic golf courses please click here. A classic golf tour for everyone to enjoy! Spend 4 nights in St Andrews, followed by 3 nights in Troon and play 6 of the top golf courses on every golfer’s bucket list including Kingsbarns, Carnoustie and Ailsa, Trump Turnberry. Enjoy 3 nights in the luxury on site lodges at Castle Stuart followed by 3 nights at Meldrum House, country hotel nestled in the heart of Aberdeenshire’s tranquil countryside, playing 6 rounds of amazing golf including Castle Stuart, Moray Golf Club and Trump International. During this St Andrews Golf Tour you will enjoy a 5 night stay at the 5 star Fairmont Hotel and play golf at the finest golf courses around ‘The Home of Golf’, including the Jubilee and Castle Course, St Andrews Links and Kingsbarns. Play every golfer’s dream, The Old Course, St Andrews with this guaranteed Old Course Golf Tour Package. Enjoy 4 nights at the 5 star Old Course Hotel in St Andrews followed by 3 nights at the luxurious Gleneagles Resort. This 7 night golf tour includes 7 rounds of top golf courses along the north east coast of Scotland including Panmure Golf Club, where in 1953 Ben Hogan practiced rigorously in preparation for his only Open appearance at Carnoustie in which he won. Known as ‘The Home of Golf’, Fife is one of the most sought after golfing destinations in Scotland and the world. Discover some of the best golf course’s Fife has to offer along with some hidden gems! With 22 wonderful courses and 30 miles of picturesque coastline, a golf tour to East Lothian is a must for any golf lover. 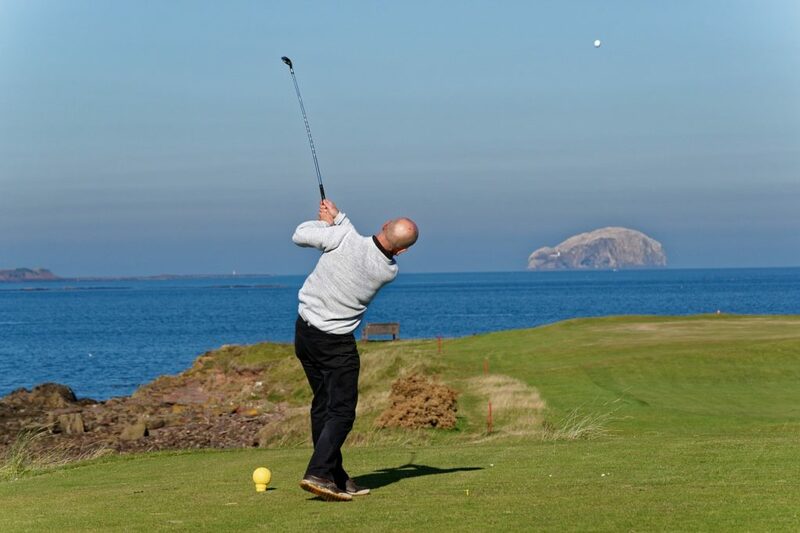 Enjoy a full week stay at North Berwick and play a total of 8 rounds of golf. One for the golf and whisky lovers! This west coast golf tour includes 6 rounds of golf including the world’s most natural golf course, Machrihanish Dunes. A dram of whisky can also be enjoyed at Springbank Distillery and Cadenhead’s Warehouse Tour. Experience the highlights of the beautiful Scottish Highlands during this golf trip with 6 rounds of golf at some of the best links courses in the area including the stunning Scottish Open venue, Castle Stuart, where Phil Mickelson won in 2013. 7 night golf tour including 4 nights in the capital city of Scotland, Edinburgh followed by 3 nights at the fantastic 5 star Gleneagles Resort. Enjoy a coaching session with PGA Pro and 6 rounds of great golf.